Why choose an Australian Labradoodle from Lomond Hills? Our goal is to produce happy, healthy and sound Australian Labradoodle puppies with excellent temperaments. Our breeding programme is based upon careful selection for genetic strength and sound temperament to ensure you receive a puppy which will be perfect for your family. 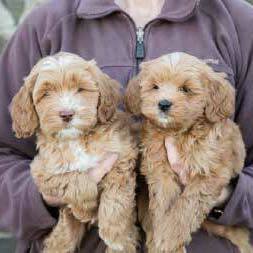 Lomond Hills puppies derive from some of the best Australian Labradoodle bloodlines in the world. Our scrupulous selection of foundation breeding stock gave us an excellent basis on which to build and we have seen continued success through generations of Lomond Hills breeding. We are professionals, and we're in it for the long haul! Lomond Hills was established in 2006 and as a family we are absolutely devoted to the care of our dogs and puppies, and to the continual development of this wonderful breed. We take great pride in what we do - our facilities have been purposely built and we have over 20 acres of pasture where our dogs love to play. We are always on hand to answer your phone calls and emails. We are at Lomond Hills caring for our dogs and puppies all of the time. Unlike many breeders, we don't have other 9-5 day jobs and leave our dogs and puppies unattended five days a week. This means that our puppies are very well socialised and have exposure to lots of new sights, sounds, smells and experiences during their time with us. Running a breeding programme and raising puppies properly is a 24/7 operation and we are committed to doing things the way they should be done. The Lomond Hills Family Care Home programme allows our breeding dogs to live with selected families in their homes, as opposed to in a kennel environment. This means that we are breeding wonderful family companions from wonderful family companions - the way it should be! Our strict and extensive health screening policy ensures that we only breed from the cream of the crop. Before breeding, all of our dogs must pass a series of tests to ensure that they are fit to be bred from and are not going to be passing on any genetic conditions that can be avoided. The test certificates are available for inspection when you visit. We produce healthier dogs by managing the coefficient of inbreeding (COI). Kennel Club registered pedigree dogs often have COIs of anything up to 30%. Here at Lomond Hills, we work with a COI of no more than 6.25% and the vast majority of our litters are under 2%. You will find very few common ancestors in our pedigrees. This greatly reduces the risk of genetic disorders in our puppies, and provides a better basis for the furthering of the Australian Labradoodle breed as a whole. The best start in life! We place great emphasis on early socialisation and enrichment. We spend hours and hours socialising and interacting with our puppies and getting them exposed to new experiences. They learn about different sights and sounds, they learn how to play with toys and with one another. Before leaving us, our puppies are spayed/neutered, fully wormed, vaccinated to date and treated with Stronghold (covers fleas, ear mites and various worms). These procedures ensure that every Lomond Hills Australian Labradoodle puppy has the best possible start in life. We assess each puppy's temperament and match them with suitable families. There is no such thing as the perfect puppy, but there is a perfect puppy for you and your family! We make it our job to ensure you get a puppy which will be a perfect fit and thrive as part of your family. The Lomond Hills two-year genetic health guarantee doesn't just give you peace of mind, it also demonstrates the confidence that we have in the Australian Labradoodle puppies that we are producing. If your Lomond Hills puppy develops a life-inhabiting disorder which is of genetic cause within the first two years of his/her life, we will refund up to 50% of the price paid. Our experience with dog-related allergies and asthma. 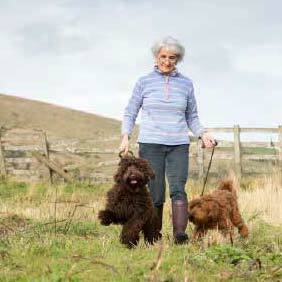 Lomond Hills Australian Labradoodles have allergy-friendly fleece and wool coats. Approximately 50% of our clients have asthma or dog related allergies and our puppies have achieved a 98% success rate with sufferers. Please note that early generation Labradoodles (F1, F1b, F2 etc) are generally not suitable for allergy/asthma sufferers because they tend to shed to some degree. 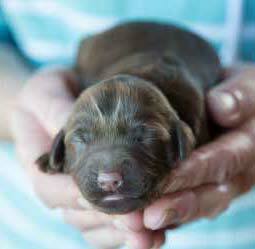 Our puppies are microchipped and registered with Petlog, the largest microchip registry in the UK. This serves as proof of ownership, deters against theft and aids the safe return of your beloved puppy if he or she ever got lost. We offer a friendly and professional export service where regulations permit. Some Lomond Hills puppies find their home as little as ten minutes down the road from us, whilst others travel several thousand miles to their new homes overseas! Because the UK is a rabies-free country, our Australian Labradoodle puppies can travel to most countries worldwide from 8-10 weeks old. Regardless of where you love, we can help to make sure your puppy gets to your home safe and sound. We are always here for you, and provide ongoing support to our clients for the life of their Australian Labradoodle. Having established 2006, we have an extensive knowledge base and a great deal of experience with the Australian Labradoodle breed and are always willing to answer your questions, however silly you think they might be! Testimonials and referrals. The vast majority of our clients like to keep in touch with us, and there is nothing more satisfying than receiving photos of the puppies that we have bred as they are growing up. Our Facebook page and Instagram are also great ways for clients to keep in touch with us.